The new definition of luxury isn’t just traveling to places no one else has been to. It’s also experiencing old destinations in a completely new way. 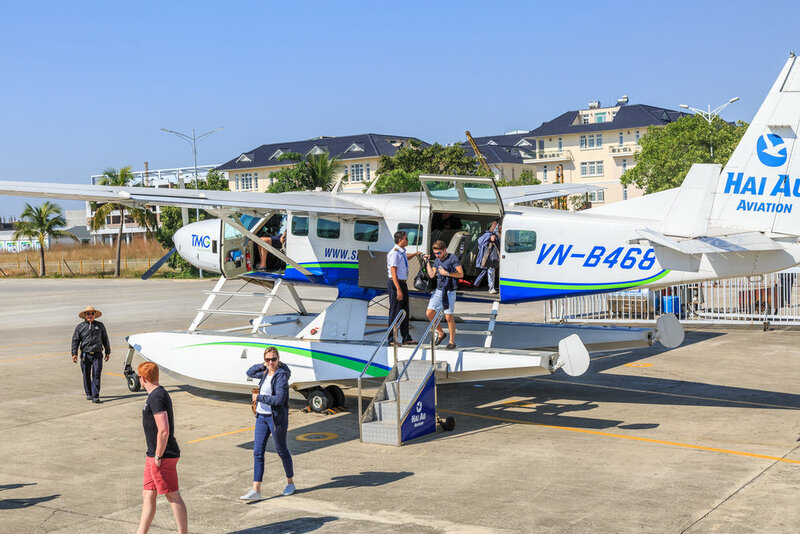 Our Premium Cruise experience is 100% private and exclusive, including a seaplane flight from Hanoi to Halong Bay to take in the impressive aerial views, as well as an intimate cruise tailored just for you and your partner. Sailing with us in Halong Bay is as close as you can get to owning your own boat but without the hassle. From a completely customizable Asian or Western menu to tailoring your cruise itinerary and pacing – deciding where to stop and for how long – our boat and her crew are ready to carry out your every whim. Off the touristy track: Boats on Halong Bay follow just 5 routes outlined. With us, you can break free from the herd and deviate from the stream of boats. 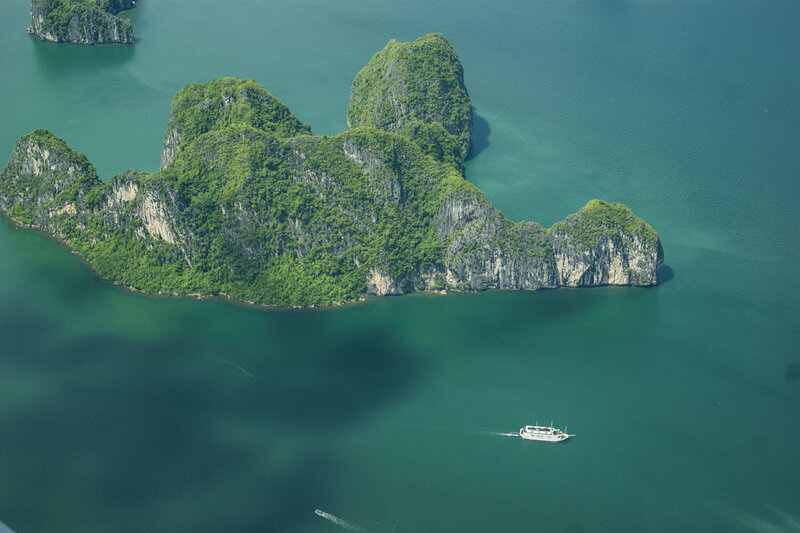 100% private and exclusive: From a private transfer to Halong Bay, to a private cabin and cruise for just you and your partner, you can enjoy the bay your way. Fully customized itinerary: Customizable itinerary and pacing, which allow you to decide where to stop and for how long. Round the clock butler service: With 5 staff to just 2 guests - you and your partner, expect an unprecedented level of personal pampering. 10:00 - 11:00 Get on seaplane. Depart Noi Bai Airport to Tuan Chau Marina. After 15’ scenic flight over Halong Bay, landing on water. 12:00 - 12:15 Transfer from the Reception Lounge to your “Premium Private” cruise to be welcomed onboard by your crew who will be hosting you. 14:30 - 15:30 Arrive and drop anchor in the Lom Bo Island area and take a guided walk through Me Cung Cave. 15:30 - 17:30 Weigh anchor and cruise to Pearl Farm. You can either choose to kayak or visiting and explore methods of raising and pearl exploitation. 17:30 - 19:00 Weigh anchor and cruise further south to “Anchorage 690 ’’. Sunset tapas snacks will be served for pre-dinner nibbles. 7:00 - 7:30 “Good Morning Vietnam”. Breakfast can be served anytime you like from 7am onwards. 8:00 - 9:00 Arrive, drop anchor and exploring walk & tour at Titop beach. 11:15 - 11:30 Check out. Disembark for the L’Azalee Cruises Reception Lounge. 11:45 - 12:00 Hai Au buggy to pick up at L’Azalee Cruise Lounge to Hai Au lounge for relax and check in for flight. 12:30 - 13:30 Take off from Tuan Chau Marina, take scenic tour above Halong Bay then fly back to Noi Bai Airport. 13:45 - 14:00 Private car to pick up to Hanoi. Arrive Hanoi downtown. Drop off at the hotel in Old Quarter. End tour.